When it comes to a great touring van, size is the big consideration. The smaller the footprint, the cosier the internal space and the greater the compromises will be. 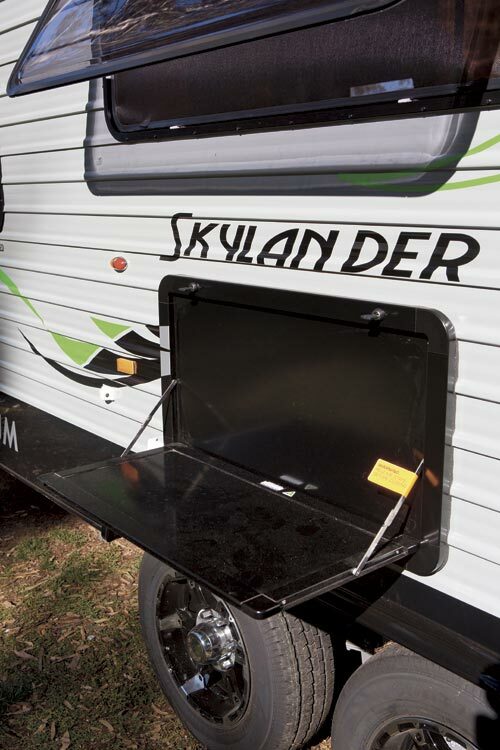 Enter: the Skylander from Titanium Caravans. Boasting a 6.2m (20ft 4in) body, you can’t help but feel the dimensions are spot-on for a good all-rounder. 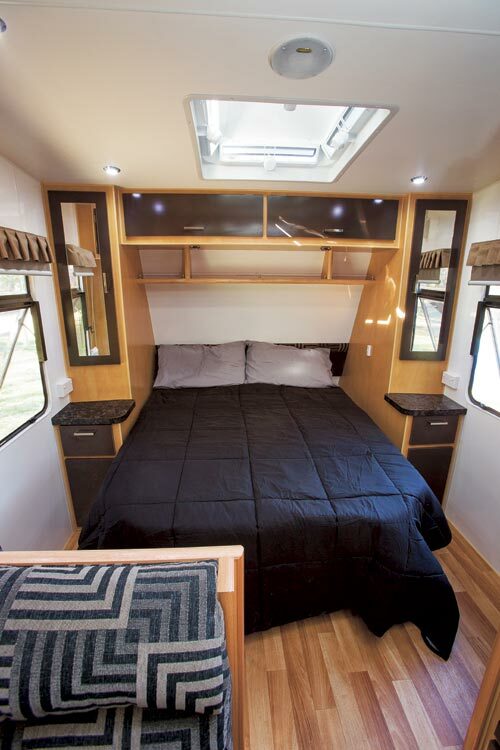 There’s no squeezing around the bed base and the interior has a sense of space without making the van too big. But while big may be better, it also adds weight and costs, both at purchase time and at the bowser. 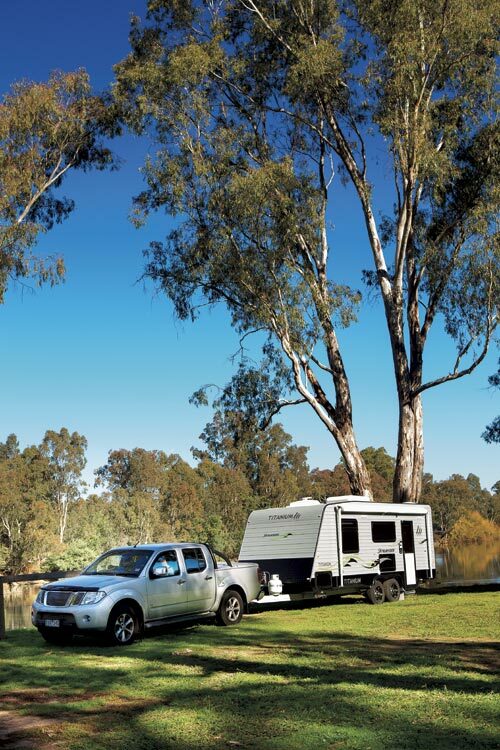 The Skylander manages a good compromise, coming in at 2040kg Tare, which puts it into the popular Toyota Prado towing range. 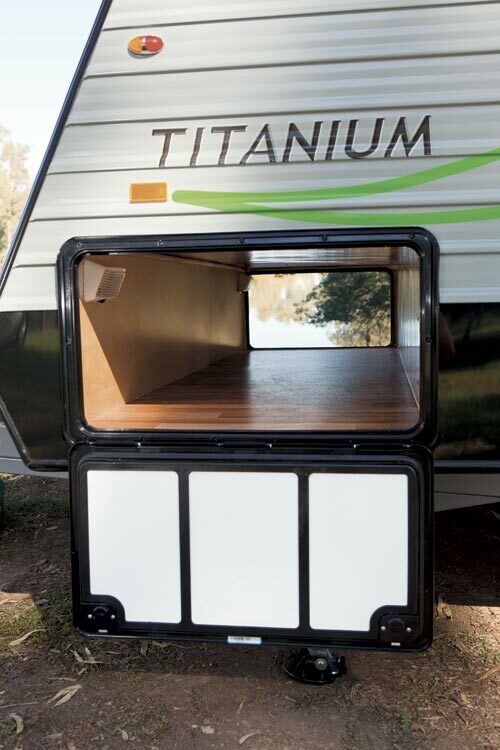 The Skylander is one of four impressive new vans from Titanium Caravans, owned by Joe and Jason Grech. Joe has been designing and manufacturing vans for more than 32 years, working for the likes of Roadstar, Galaxy and Windsor, so there is plenty of experience behind the brand. Blessed with good looks, the Skylander features black highlights on gun-metal grey cladding, alloy wheels, tinted acrylic windows, colour-coded checkerplate, composite highlight panels and contrasting graphics. Up front, a 4in DuraGal (6in option) reinforced drawbar supports a standard 50mm ball coupling, removable jockey wheel, twin 9kg gas bottles and the handbrake, while stainless steel mesh between the rails provides an external storage space. 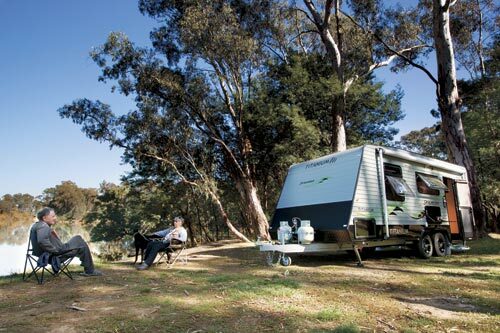 The Austrail chassis mates to seven-leaf spring packs on dual beam axles, 10in electric brakes and 15in wheels. The 12V electrical requirements are handled through a 100Ah battery, housed in a vented box under the chassis, and boosted by a 30A charger when connected to mains power. A safety switch, individually-fused distribution block and breakaway kit complete the electrical essentials. 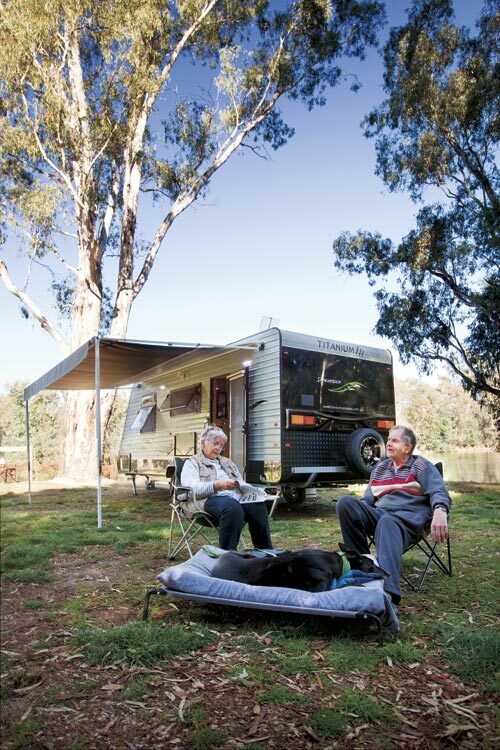 Running an eye around the van, you’ll find a tunnel boot, large windows over the bedroom and dinette, an awning, 240V and aerial connections, a fold-out picnic table, dual wall-mounted LED lights and a Camec security door on the nearside. 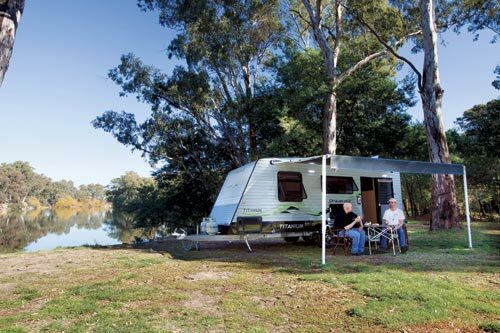 The offside has a small high-set ensuite window, lockable water inlet, toilet cassette access, hot water service breather, kitchen window, appliance vents, aerial and a large bedroom window. A galvanised bumper bar with spare alloy wheel is fixed to the rear, with a contrasting composite panel, colour-coded checkerplate and LED taillights. The modern styling continues on the inside with flat pack furniture in a chocolate colour with natural timber tones and black highlights, soft furnishings and Laminex benchtops. 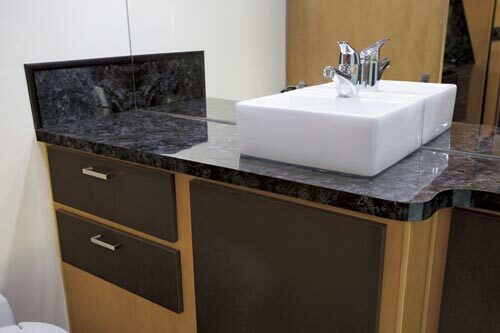 Don’t dismay if the colours aren’t to your liking, as there are plenty of options to choose from. All windows are fitted with pelmets, roll-down block-out blinds, flywire and manual winders. Two Four Seasons hatches in the roof and the Camec security door with insect mesh provide additional ventilation. And there is also a roof-mounted, remote-controlled Aircommand Ibis air-conditioner for good measure. 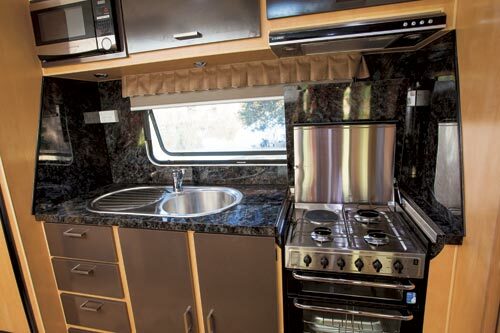 The kitchen fills out the mid-offside of the van with a three-way 184L fridge freezer, a four-burner stove, rangehood, grill and full oven, as well as a large stainless steel sink with drainer and flick-mixer tap. All the cupboards are fully lined, which adds a pleasing level of refinement. Being a brand new van, the friction catches on the drawers which prevent them opening in transit were a little sticky, but no doubt they’ll free up with wear. 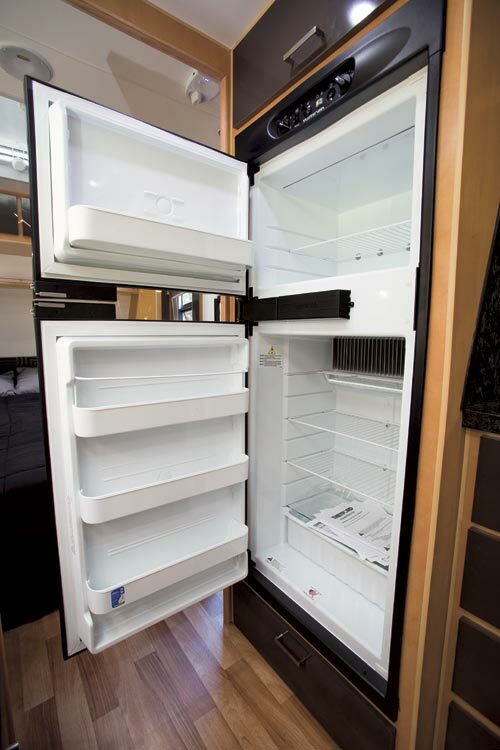 LED downlights are fitted to all overhead cupboards and complement the other LED lighting throughout the van. 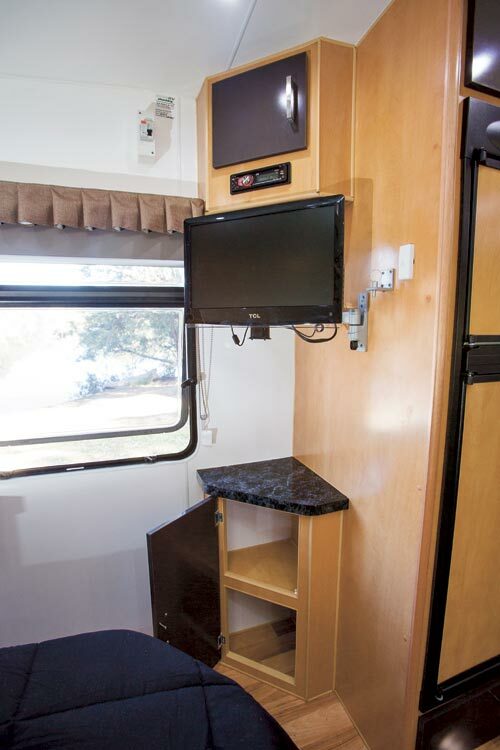 Storage is plentiful at head height, below the bench, and under the dinette seats and bed. Access below the bed will be improved in future models with longer gas struts. 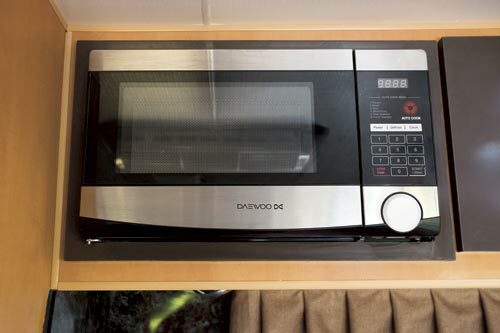 The only other minor niggle is the location of the microwave – it’s not ideal for the safe handling of hot foods, but, with the custom nature of the van, you can have it installed anywhere you like. The dinette table will seat two people comfortably and can drop down to sleep a couple of kiddies using a cushion infill. A double 240V socket is located above the table for powering devices. In fact, there are plenty of sockets sensibly located through the van. A queen-size orthopaedic innerspring mattress runs north-south, nestled between the deep mirrored robes, bedside tables and drawers. Other small cupboards are located at the foot of the bed. Entertainment is courtesy of a 12V LED TV on a pivoting mount. A digital roof-mounted aerial electronically rotates and an indicator shows the best signal direction. Movie and audio fans will be entertained by the Kenwood DVD/CD player with MP3 input, feeding through ceiling-mounted speakers. 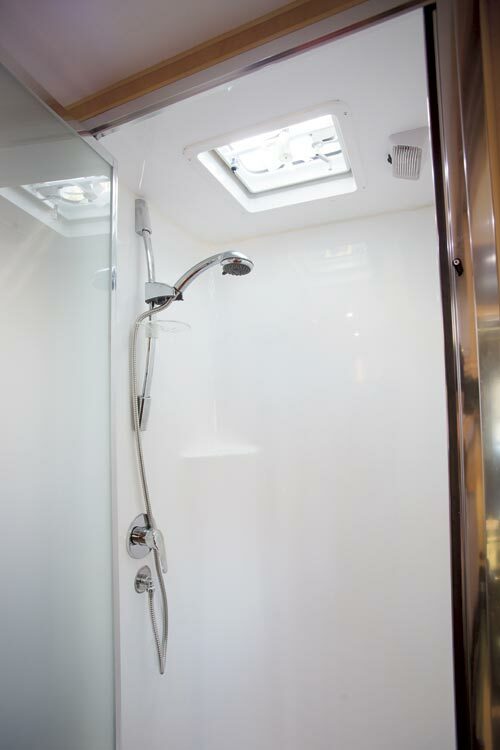 The ensuite fills out the rear of the van, with a separate fully-sealed shower, 12V extraction fan, cassette toilet, vanity unit, inbuilt top-loading washing machine and a stylish basin. I found the basin a little bit small, but Joe tells me a larger one is in the pipeline. 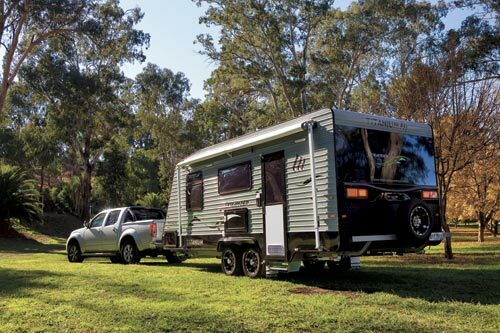 Out on the blacktop, the van towed exceptionally well on our test run north of Melbourne, Vic, to Seymour on the Goulburn River, riding effortlessly behind our Navara V6 turbo diesel tow tug. While not fitted as standard, I’d favour the Al-Ko Electronic Stability Control for an additional safety buffer, particularly for high speed runs along major highways shared with the bigger trucks. It is hard not to be impressed by the Titanium Skylander. 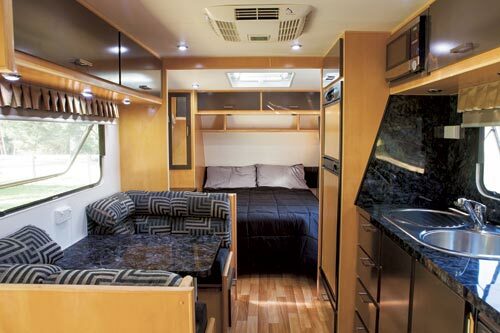 It is packaged with comfortable touring in mind, with room to move and plenty of standard goodies. 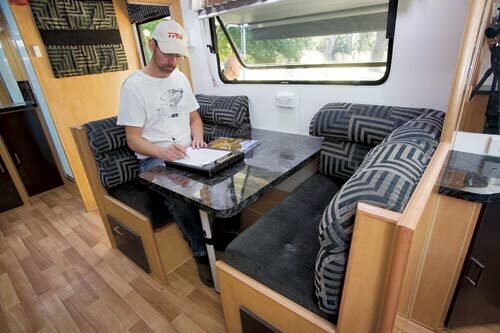 Titanium offers a transparent service, where buyers can visit the factory at any time to view their van in progress. But the deal maker is the sharp price point – all this for a smidge under $60k.